Today the Government’s Business Secretary, Sajid Javid, met some of the company’s trainees and praised Jaguar Land Rover for backing the next generation of British talent. With some 2,500 employees having started their careers on Jaguar Land Rover’s graduate, advanced and higher apprentice programmes over the past five years, this year’s intake is the largest to date and more than 100 up on last year. The new graduates and apprentices are the first to start their training as part of the Jaguar Land Rover Academy, which was officially launched this week. The new Academy will offer learning and development for employees at all stages of their working lives with the company, whether they are new recruits or more experienced employees seeking to move to the next level in the organisation. This “lifelong learning” will follow a structured plan, delivering training that is relevant to changing business requirements and enabling employees to progress their careers at Jaguar Land Rover. The Business Secretary met the apprentices and graduates at a UK car industry event held by the Society of Motor Manufacturers and Traders (SMMT) today, ahead of next week’s Frankfurt international motor show. At Frankfurt, Jaguar Land Rover will be showcasing its British designed, engineered and produced vehicles. As part of this, the company promises a dramatic reveal of the all-new Jaguar F-PACE, the brand’s first performance crossover. The graduates and apprentices have begun their programmes with a joint formal induction week at the Ricoh Arena, Coventry. Designed to inspire participants, the induction has included motivational talks from Richard Noble, the former land speed record holder and Kenton Cool, one of the world’s leading high-altitude climbers. Those attending have also had the chance to put questions to Dr Speth and other members of the company’s executive committee, familiarise themselves with the latest vehicles and have a glimpse at the future line-up. Jaguar Land Rover’s undergraduate placement scheme is increasingly becoming a feeder for the graduate programme, with 85 of the 333 graduates joining this week previously having been on paid undergraduate placements with the company. 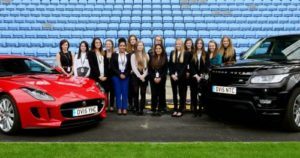 Similarly, the company’s Young Women In The Know course has led to an increase in the number of females taking up advanced and higher apprenticeships at Jaguar Land Rover. 14 of the girls who took the course last year are amongst the 46 new female apprentices. The Young Women In The Know initiative, launched in August 2013 as part of Jaguar Land Rover’s wider education outreach, offers female students aged 15 – 18 a unique insight into engineering, technology and manufacturing careers. To apply for the 2016 graduate programme or undergraduate work placements, students should go towww.jaguarlandrovercareers.com. Recruitment for the graduate and undergraduate programmes began this week and closes on 31st December 2015. The recruitment window for advanced and higher apprenticeships opens on 5th October 2015, with the deadline for apprentice applications also being 31st December 2015.